Now, one of the obstacles to reading the books of the Bible is that we don't approach them in the correct way. We treat the Bible more like a textbook to be mined for little bits of advice for good living, rather than the grand narrative it is -- telling the story of God's work of creation, rescue, and restoration of a fallen and broken world. A story big enough to make sense of our lives, which, in the words of Eugene Peterson, are lived in storied conditions. But most of us need help to see it and read it as this big story. And by God's grace, there are a couple of wonderful organizations creating remarkable tools to provide the help we need. The first is a group called Read Scripture. 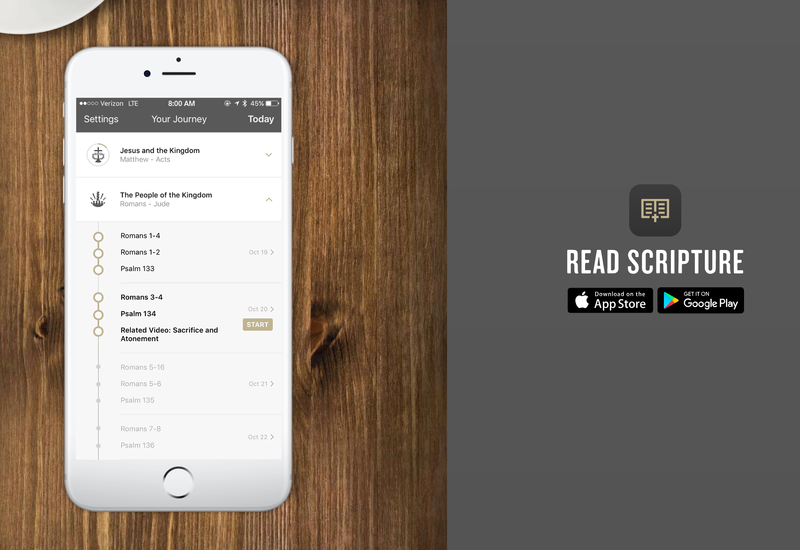 They have designed an app that breaks the books of the Bible into sixteen large sections to help you get a handle on the story God has told, and is still telling. Click on the picture below to go to their site and download the app. I have been amazed at how helpful it has been to use this app to direct my daily communion time with our Father. Each day, I sit down with my morning smoothie and open the app on my phone. It instructs me to "take a deep breath before you begin to spend time with God," and then supplies my first reading for the morning. I open the text in my physical Bible, because I am still old school that way. I use The Books of the Bible, as it has a far more helpful order for the books in the Bible (e.g., the first testament follows the common Hebrew version for ordering, and the second testament is ordered in a far more logical way than traditional bibles). And, it has removed all chapter and verse numbering, as well as a far more aesthetically pleasing format. In other words, it looks like something you'd actually want to read. After that first reading, the app then instructs me to "move into a time of prayer and meditate on the following Psalm," and I again open up in my paper copy and read the Psalm and then spend time in conversation with God. In order to better understand what what the Read Scripture and Bible Project teams are doing to help us see the story of the Bible, take a mere three minutes to help you make the decision to read and understand the whole story of the Bible in a way you never have - a promise they actually deliver on! I can't recommend this to you enough. I have read through the Bible every year for around the last fifteen years using various kinds of reading plans. I have a seminary education from a fine institution, and have been in vocational ministry for over thirteen years. And these resources have helped me see and understand the big story of the books of the Bible in a way that I never have. My nineteen year old daughter has exclaimed that she has "never enjoyed reading the bible as much as I have this year daddy!" And our family worship has been refreshing and invigorating as we make our way through the overview videos for all sixty-six books of the bible. Why not "see for yourself the beauty and wisdom of this ancient story that points us to Jesus"? For further encouragement, it would be worth your time to view the video below from the Read Scripture team. 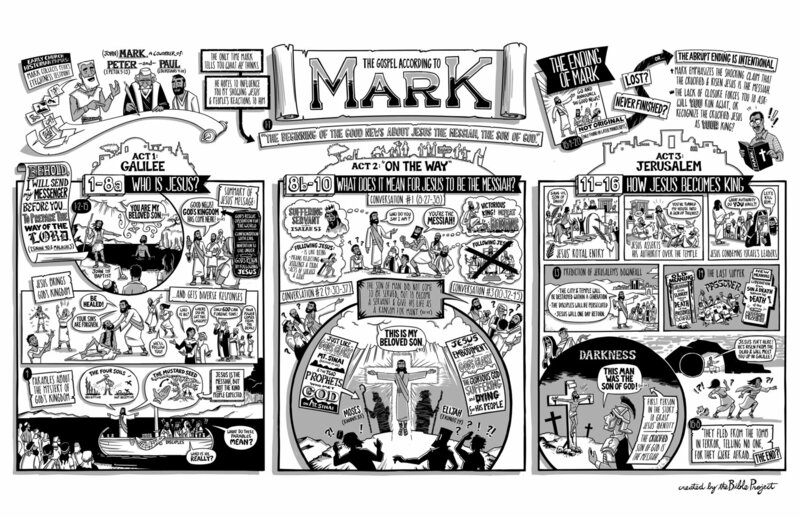 And below that, as an example, I have inserted the overview video of Mark's story of Jesus from The Bible Project team. It is my prayer that all of this will lead you to immerse yourself in the only Story that makes sense of all our stories.